Local roofers have lagged behind other industries when it comes to promoting services through digital means. While some businesses have thrived on internet promotion, local roofing contractors have not fully capitalized on the internet’s powerful marketing influence. 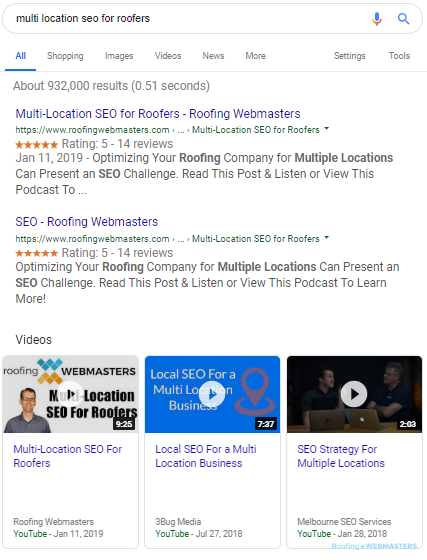 In 2019, roofers can use search engine optimization to attract new customers at a rate they’ve never before experienced. Since local roofing companies are often passed down from one generation to the next, old-school marketing measures have remained part of the fabric of the industry. But consumers are no longer looking through the Yellow Pages for a local roofer, nor are they as affected by a local TV spot (most people are watching streaming video). Internet channels have replaced those antiquated platforms as the means through which local customers find qualified roofing services in their area. 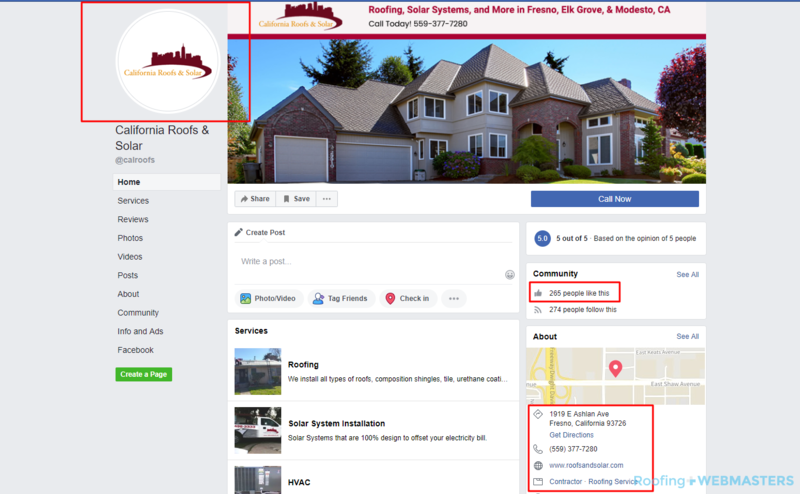 Whether it is a simple Google search that produces organic results, or one that that yields Local Maps results and NAP citation listings on Facebook, the world wide web is the go-to source for a roofer’s target customer in 2019. 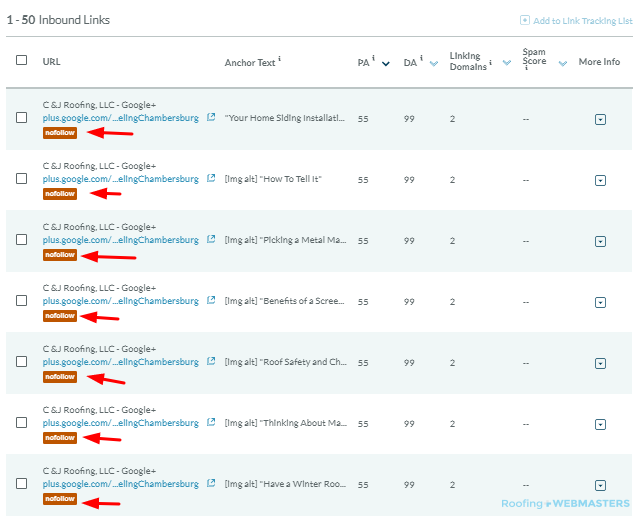 What is Roofing SEO (in 2019)? Roofing SEO is the process of refining digital content in order to rank higher on Google search results for topically relevant keywords. Why Roofing SEO is Important? 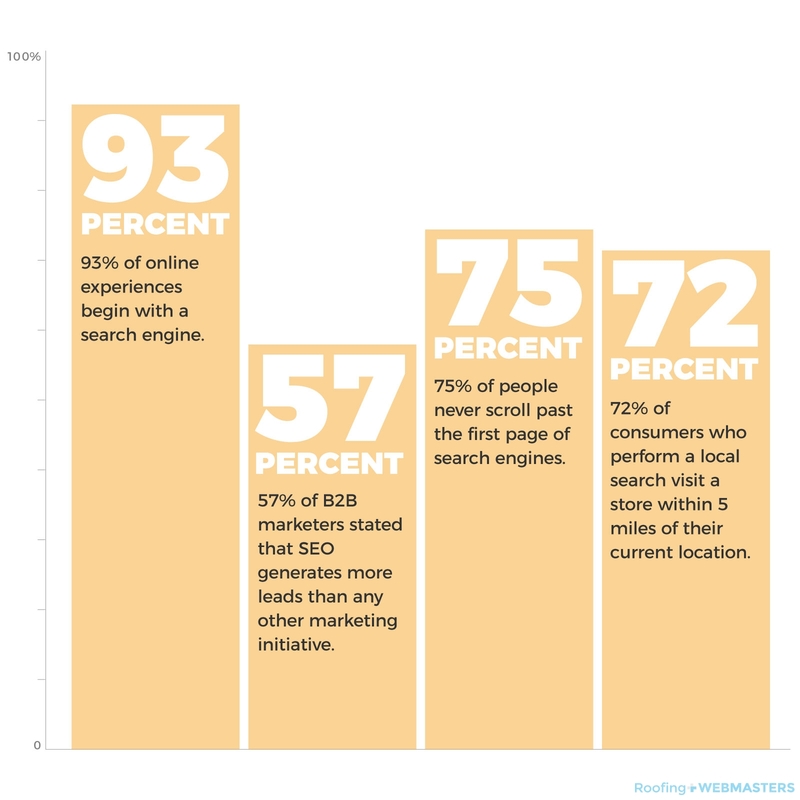 Not every visitor guarantees a lead of course, as there are steps to a successful digital marketing strategy that go beyond the rankings themselves. For example, once a visitor enters your website or views your listing, you want to make it as simple as possible for them to contact you. Furthermore, if they enter your website, you want your services to be explained clearly so that the prospective customer can quickly determine that you provide what they are looking for. Executing each of these tasks, along with others, is known as the process of conversion rate optimization (more on that later). But before CRO is needed, SEO is required. Think of SEO as a form of inbound marketing. Instead of old-school tactics that would disturb a potential customer, like telemarketing, for example, SEO encourages consumers to find your services on their own volition. As consumers have become more aware of manipulation in the digital age, they’d much rather feel in control of their own decision-making process, than to have a service imposed onto them by a heavy-handed conglomerate. Optimization is not something that can be executed as-you-go. For SEO to work, a strategy must be prepared prior to its implementation. The foundation of an SEO strategy is keyword research. 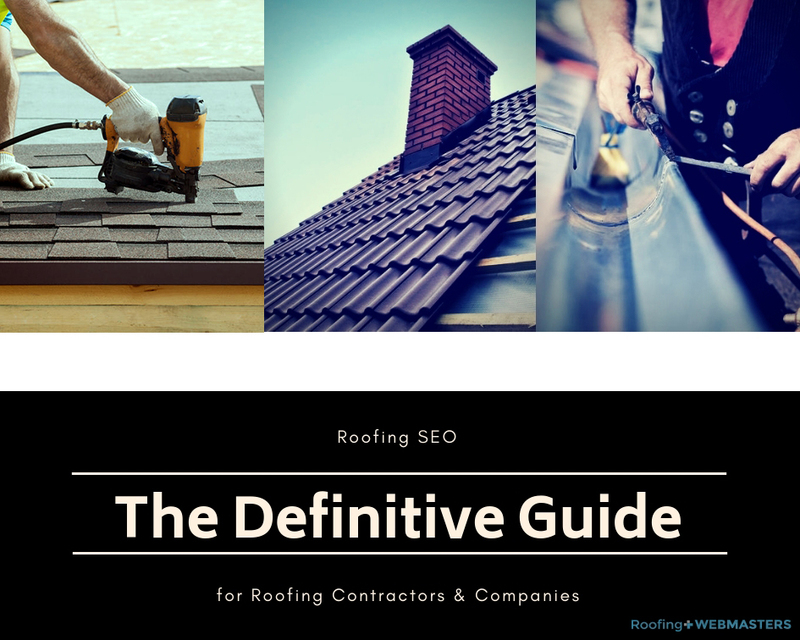 For roofing contractors, the goal is to identify terms that will attract the most relevant consumers to your website and other digital entities. 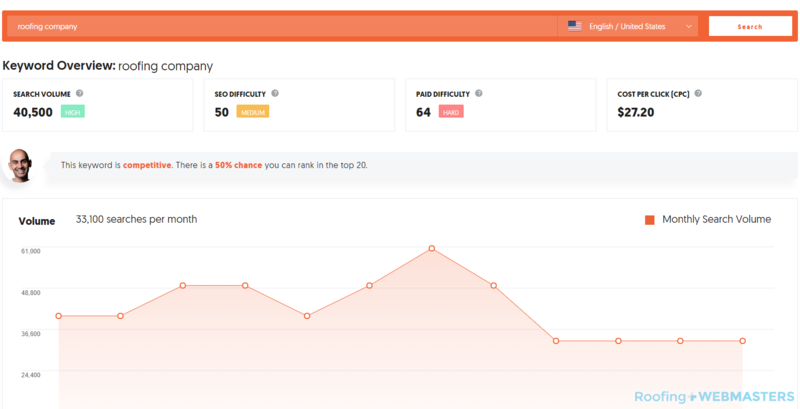 From there you’ll want to note the keyword’s search volume, difficulty, and competition level, all of which can be measured through tools like Moz, SEMRush, and even Ubersuggest. Choosing the right keywords will instruct each subsequent action, such as developing a URL hierarchy, writing content, and executing on page SEO. Keywords and the search queries that inform them don’t exist in a vacuum. There’s a method to keyword research that is calculated and intentional. In many ways, a keyword represents your target customer. If you run a roofing company in Hartford, CT, you aren’t going to want clicks from people in New York City. That’s obvious, but there are also other characteristics of a target customer that are less blatant. For instance, if your keywords target people who want commercial roof repair but you only offer residential roof repair, you’re wasting your time and theirs. You also hurt your chances of securing a top ranking spot, as visitors who want commercial services will exit quickly and increase your site’s bounce rate (more on that later). Don’t worry. Local websites aren’t competing against everyone in the country for the same term. 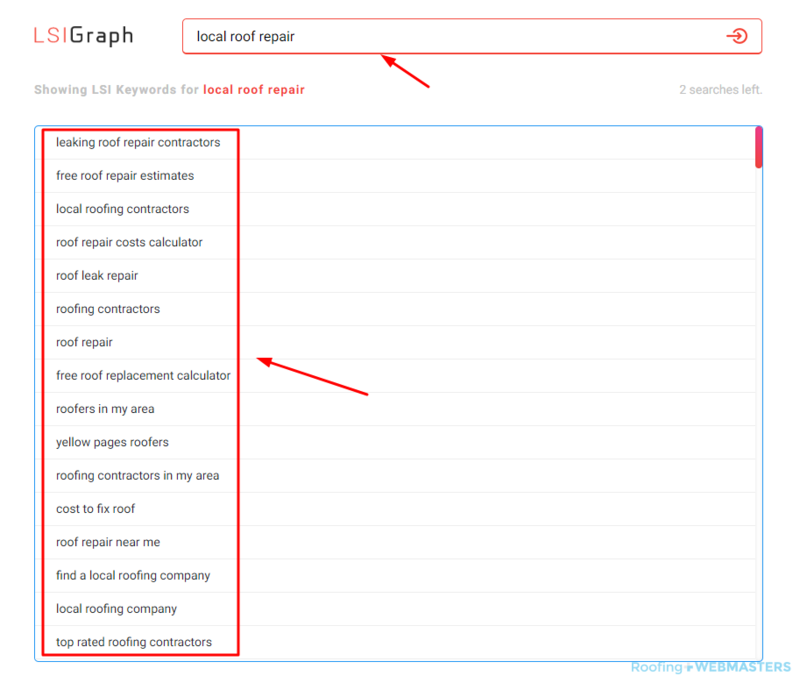 So high-volume keywords like roofer, roofing company, roofing services, etc. are dependent on the searcher’s location. Every roofer should be aware of the top roofing keywords before starting their more extensive keyword research. These terms are the basis of your overall strategy and can help you brainstorm ideas for long tail keywords that will be even more relevant to your local business and help you generate the right kinds of roofing leads in 2019. For local roofers, the most optimal keywords include reference to the target service area. So for example, the keyword “roof repair” shows consistently high volume throughout all parts of the United States. If your company serves Atlanta, GA, your keyword would be “roof repair Atlanta” or “Atlanta roof repair.” In other words, you want the keyword + location to create a local keyword. Many of the tools previously mentioned, Moz, SEMRush, etc. can show you the volume of local keywords. For example, “roof repair Atlanta” has a search volume of 11-50 according to Moz and therefore would be a better term to target than “Atlanta roof repair” which has a volume of 0-10. You should still use both terms within the body of your content, in support of something we’ll discuss in greater detail later; Latent Semantic Indexing (LSI) … but for your traditional on-page SEO (meta, title, headers, etc. ), “roof repair Atlanta” will be the more valuable search term. 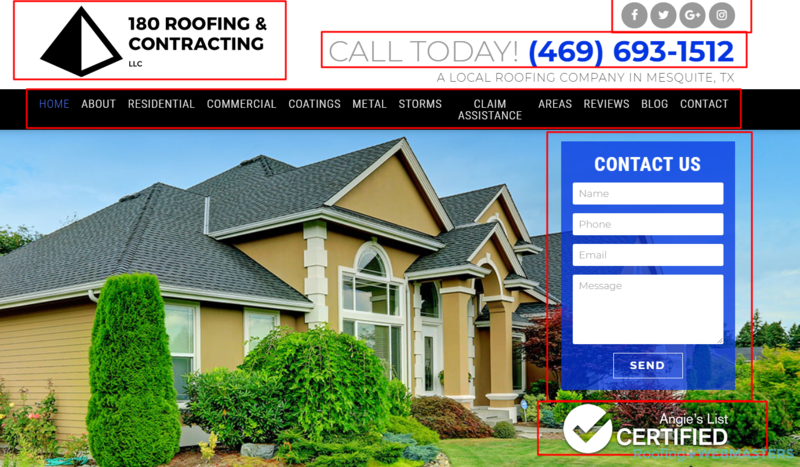 Roofing websites that are most successful have interior pages describing more specific services offered by their company. Just like with your homepage, these internal pages will need to target keywords to help them rank. Let’s say your company provides a modified bitumen roof installation. If so, you’ll want to research the volume for terms like “modified bitumen roofing services” and “modified bitumen flat roof installation.” Once again, you will want to add the location term to make it long tail. 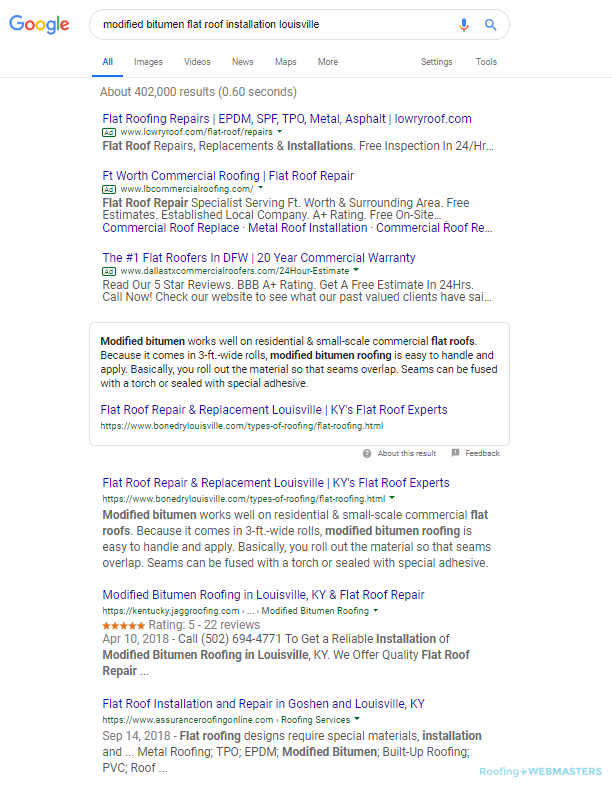 So if you operate in Louisville, KY, the keyword would look like “modified bitumen flat roof installation Louisville.” With such a long tail keyword, you’d have a significant chance or ranking in the top 5 on Google for that search query, and if you execute it well, possibly even #1. Once you research and identify the best keywords for your roofing company, you must construct a URL hierarchy that will instruct how your pages are formed. Every website has a homepage, and most have an About Us and Contact Us page as well. What separates roofing websites from one another is the structure of the site and how deep it goes. Main service pages are going to be known as top level pages, sometimes called parent pages. For larger roofing companies who provide both residential and commercial services, each one of those main categories would represent a parent page. Underneath those main pages on the hierarchy would be more specific pages, known as lower level pages or child pages. So commercial roof repair would be a child page of commercial roofing while residential roof replacement would be a child page of residential roofing. Child pages can be drilled down several levels. If you have a parent page of commercial roofing and a child page of flat roofing, you can have yet another child page beneath that for something like modified bitumen. You should not go more than 3 pages deep in a hierarchy however, as longer URLs are more difficult for Google to crawl and therefore less likely to rank well on SERPs. User experience is important for a website’s performance and that’s why images and videos should be pre-selected in an SEO strategy. If you’ve designated certain images for certain pages, you prevent duplication and accidental misuse of wrong pictures. The best images are always original, meaning they are shots of your actual company, facility, employees, equipment, and transportation. The worst images are stock photos, which are last resorts for roofers who don’t have any photos of themselves and don’t care to take out their iPhone and snap a couple on an early Tuesday morning. To really maximize a site’s performance, original and unique images are necessary. With advancements in technology, specifically that of smartphones, this is easier than ever to achieve. Once you denote images for pages, you can complete your SEO strategy, and start using it for the implementation stage. SEO is a massive-scale undertaking that is best understood when broken down into subcategories. Because it is such a wide-ranging concept, it’s best to define aspects of optimization from an inverted perspective. In other words, if the ends (improving search ranking) justifies the means (the step that’s taken to achieve it) than it is without question an aspect of SEO. You shouldn’t expect to understand every optimization method utilized on the web at first glance. In fact, there will be several concepts that will seem foreign to you, at least initially. By constructing a strategy prior to implementation, it can instruct the optimization process in real-time and ensure precise execution that has been supported by research and critical thought. Like we said towards the beginning, SEO is not an as-you-go process. Yes, Google will evolve its algorithms with each passing week, year, and decade, but the goal for roofers is to create a foundation strong enough to withstand advancements and malleable enough to evolve alongside them. Research and planning is the only way to ensure that that is, in fact, the case. When visitors arrive at your roofing website, they make a subconscious decision about it within seconds. Most of the time, this decision instructs whether or not they stay on your website, or move on to the next result on the corresponding SERP. There are several factors at play that influence a user’s experience. Some of them are less tangible, like aesthetics, while some of them are more definable, like resolution. Aside from how the site looks, users covet simple navigation, clear and convincing calls to action, clean graphics, and instructive menus. 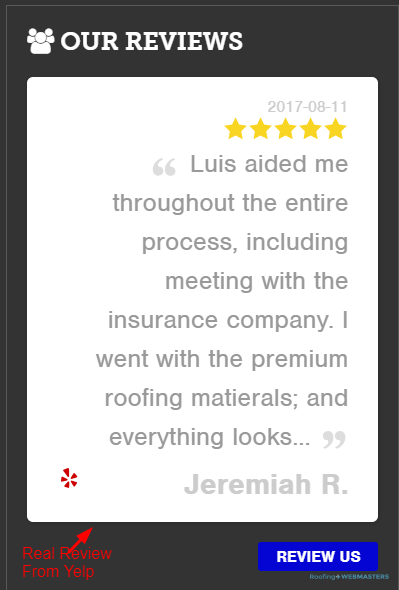 Overall, visitors of a roofing site want to feel secure with the company’s reputation and leave with an impression of trust and reliability. One common indicator of a scam website is an obsolete design. If it looks like your business page was created with DreamWeaver in 2003, you can expect Google to confirm the suspicion by removing it from the top of search rankings. The front-end view of a website is not the only portion of its design. The back-end is also part of the design process. Clean code, including schema microdata, which helps Google parcel data, can help a site rank well on SERPs despite the visitor never actually seeing the raw code with their own eyes. The most important part of local SEO for roofers is contact information. Since the lead conversion funnel is predicated on the visitor’s call to action, NAP visibility is paramount. For those unfamiliar with the acronym; NAP stands for name, address, & phone number and that information should be clearly evident on each page of your website (especially the homepage). In addition to its presence, its accuracy is equally as vital. A mistake with your company address or phone number can result in a substantial loss of leads. Worse yet, it can initiate a snowball effect that drops your rankings because of poor user experience, inconsistent NAP listings, and decreasing trust authority. Sometimes a small error can have large implications for a roofing contractor. For this reason, doing a check of your phone numbers on each page is a good habit to get into. A call to action (CTA) is often an urgent showcasing of your contact info. To put it simply, it is the incentive that encourages a website visitor to actually call your number or to complete some other kind of action that gets them inside your sales funnel. The simplest CTA’s urge a user to call your number straight from their mobile device (i.e. a clickable phone number button) while more complex CTA’s cast a less demonstrative hook such as a “Free SEO Audit” button.” Sometimes the latter CTA is effective because the prospective customer remains uncommitted to your services. This casts a wider net and also gets a larger volume of visitors through the initial point of your sales funnel. It’s not as easy to convert these groups as it is with people from direct phone calls, but it at least puts them on your radar and generates some buzz for your local roofing company. Nothing establishes trust better than personalization. We touched on this earlier and will drive home the point right now. 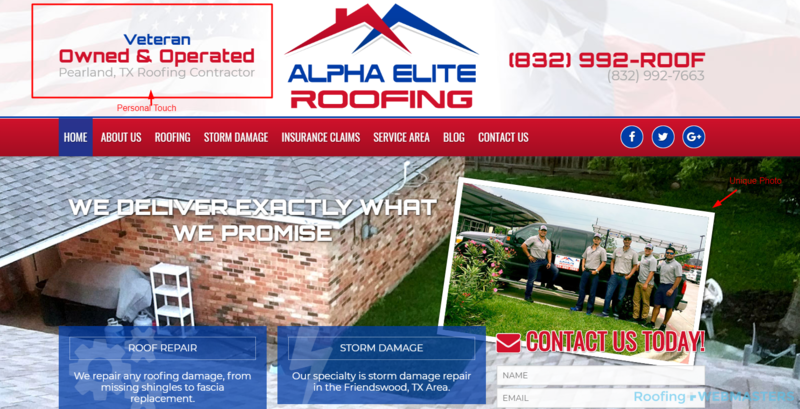 A roofing company website should display images of your roofing company. Photos can be created in a number of different ways. It can be as simple as snapping some photos of your employees and trucks with your smartphone device. It can be as advanced as hiring a professional photographer to follow around your crew for an entire day. The moral of the story is this; you have a multitude of options to personalize your website. As is the case with many of our recommendations, executing this strategy is especially important on the homepage. Prospective customers want to know who they’re dealing with. Stock photos that are found on free use image websites won’t convey trust or appeal and will discourage website conversion rates. Images of your business create trust through personalization while badges and accolades create trust through reputation. If your business has ever received any type of certification, you can receive a digital badge for use on your website. This can be from national organizations like the Better Business Bureau or local ones like your regional Chamber of Commerce. Other ideas for badges include newspapers and news websites on which you’ve been featured. Have you ever been interviewed by a local reporter? If so, you can absolutely add an icon of the newspaper in an “As Seen On” section of your website. Images are great, but videos are even better. If you have video of some of your roofing jobs, perhaps before and after shots, they can really take your website to the next level. 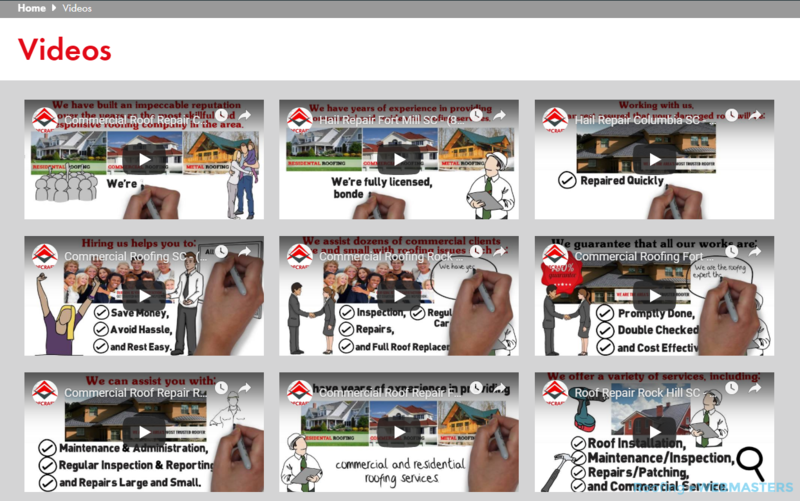 Video is the fastest growing content asset in the world, and very few roofers feature them on their company websites. This represents a market inefficiency for roofing contractors who can capitalize by simply taking the time and effort to produce videos. Again, some of this can be done using a modern mobile device, and the need for a professional videographer is not required. It’s most ideal to first upload your video to YouTube and then embed the code from that video into your website’s HTML. This way, you have a chance to rank on Google video search, YouTube search, while at the same time enhancing the value of your company website, which can in of itself improve its ranking. Another great multimedia format is audio, especially in the form of podcasts which can by syndicated through major outlets like Apple and Spotify, both of which will increase brand appeal almost instantly. Most roofers are aware of the importance of Google Reviews but did you know that showcasing testimonials on your homepage can be an SEO factor as well? For one, reviews are user-generated content, which Google loves. Secondly, verifiable reviews showcased on your company’s homepage manifests an enhanced user experience while embedding trust within the consciousness of visitors. There are plugins that exist to show reviews on a homepage. One of them is Righteous Reviews, which actually helps roofers generate more reviews on Google and Facebook while showcasing the ones they already have directly on their website. A plugin like this is the best of all worlds because it combines user content, trust, and brand awareness. In 2019, it shouldn’t be a surprise to learn that most visitors are accessing websites through a mobile device. With this knowledge, every roofer should ensure their site is mobile optimized. With the onset of Google’s mobile-first index update, they’ve made it clear that pages with mobile appeal will be given priority on search results. There’s no shortage of factors that can enhance a mobile webpage, and the same is true of factors that can ruin them. Enhancements include responsive design, clean navigation, and clickable calls to action. Negative factors include viewport distortion, slow loading times, and image misalignment. As you might imagine, the attention span of mobile users is exceedingly short, and there’s little that can be done to retrieve it once it has passed. The best tool Google has to offer roofing companies is Google Analytics. It provides measurable results of your website’s performance and can produce reports to help improve weaknesses and capitalize on strengths. Perhaps the most important feature of Analytics is the Acquisition Report. This report tells webmasters how many visits their website is getting on a daily, weekly, monthly, and yearly basis, including a breakdown of where the clicks are coming from (i.e. organic, direct, referral, etc.) Although Analytics is somewhat limited in that they reveal very few of the exact search queries that lead to your clicks, simple comparative analysis can help you deduce exactly what is driving your traffic and instruct ways to take the next step moving forward in 2019. If you see sudden shifts in your traffic, either up or down, you’ll be able to diagnose issues and address website needs. 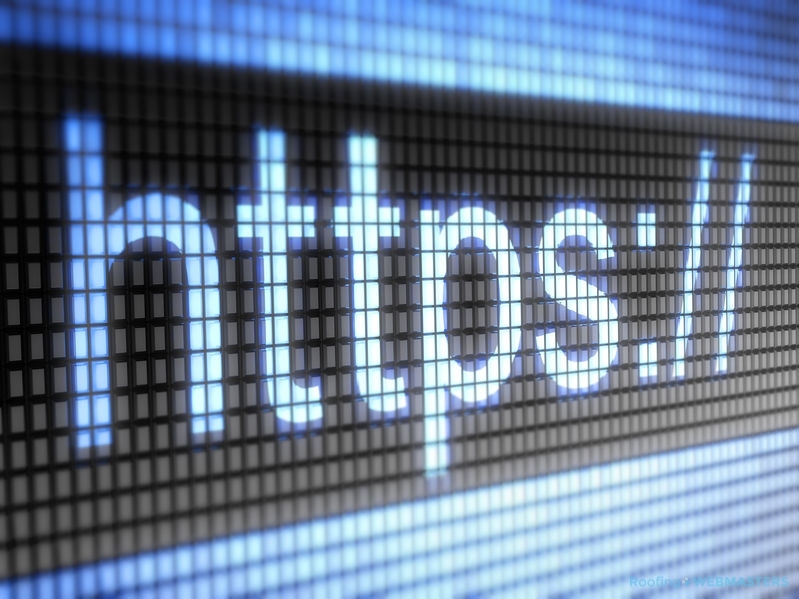 Browsers in 2019 will warn users when they are on a website that is not secure, meaning one that has Http:// instead of https://. If you are unfamiliar with SSL security, it is a security protocol that protects data transfers over the web. Sites that have it enabled are https:// addresses, which is exactly what you’ll want your site to display. Not only is SSL indicative of trust but it makes for superior user experience. While roofers rarely sell products online (e-commerce) they still want to create the optics of strong security. Because it can influence a user’s perception of your site, SSL must be considered at the very least; an indirect SEO ranking factor in 2019. 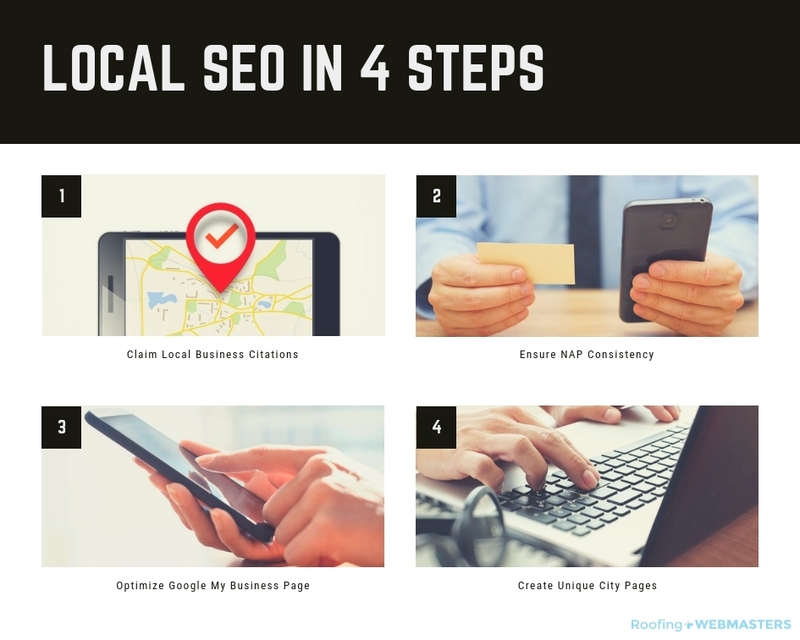 Local roofers will rely heavily on Google My Business and Google Maps to help their business rank on local search results. 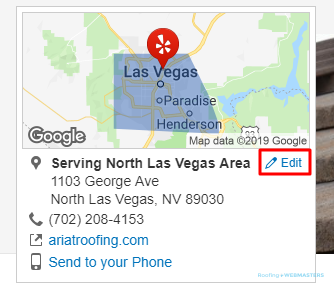 The address listed on your homepage (something we discussed previously) should exactly match the one listed on your Google My Business listing which will, in turn, appear on Google Maps. The goal is to appear in the Local Map Pack which is a snippet of the top 3 Google My Business listings in a particular service area. Of course, you’ll also want to rank on traditional organic results for queries involving your target keywords and locations. Keep in mind that you should only target cities that you can actually service and that the closer your address is to the target area, the more likely you are to rank for the term, especially on Google Maps. Some companies are large enough to where they require multi-location SEO. This is only true for roofers who have more than one legitimate business location with a verifiable address. Since Google My Business listings are verified through postcard confirmation, any kind of illegitimate address is prohibited. These include virtual offices, PO boxes, and anything that cannot be considered a place of business. Google My Business recently altered its requirements for businesses that operate out of a house. If your roofing business address is also your residence, Google My Business asks you do not include the address itself on the listing. Still, you’ll need to verify that address privately using the aforementioned postcard verification method. Most contractors have heard of directories like Angie’s List and HomeAdvisor which are platforms for NAP citations. There are countless amounts of directories on which to cite your local roofing business. From niche directories like Angie’s List and HomeAdvisor to more generalized platforms like Yelp and BBB. Some of these directories offer premium services which you should consider separate from the citation itself. The goal is to claim all of your free citations and to ensure the accuracy of the ones that already exist. Sometimes you’ll find that citations exist which were never manually created by you. This can be from data mining sources like Acxiom which pull your company info from public records and then sell it to the major data distributors. Tools like Whitespark and Moz Local can help you claim and correct citations. In congruence with claiming business citations on local business directories, you’ll want to simultaneously ensure the consistency of each of them. 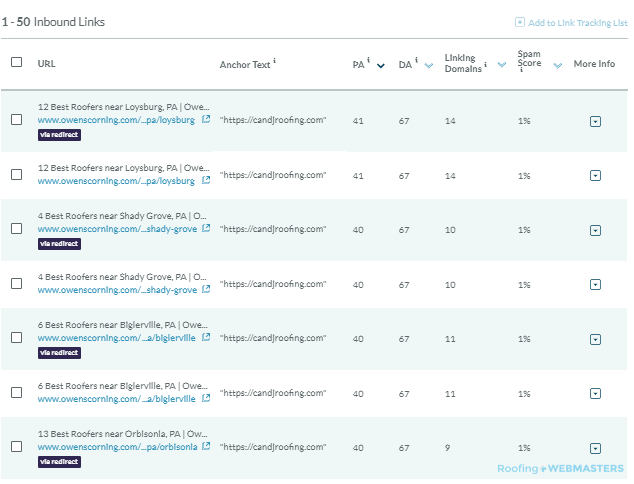 Tools previously mentioned like Whitespark and Moz Local can help streamline that process, especially for tenured businesses that have thousands and thousands of citations. Accuracy is, of course, the most important factor, but consistency matters as well. Even if your address uses a suffix that varies in spelling, you want it to be identical on every citation. For this reason, choose a singular suffix spelling and stick with it for every citation. Google My Business is a directory in of itself but it is also so much more than that. It is the central hub of your entire local SEO strategy. Not only should your GMB listing be claimed, verified, and accurate, but it should also be optimized for conversion. We spoke previously about website conversions, but Google My Business listings can also be a major source of leads. The best way to increase conversions is to optimize your listing with company photos, Google posts, and Q & A content. Furthermore, you want to include the Call Now button so that mobile users can click straight from their mobile device, and connect with you through a call. Even roofers with one location often serve multiple cities within a radius. To reach those cities, you must create unique and informative city pages which are optimized for their own respective locations. We strongly discourage mass production of city or county pages, which is a tactic that is known as “spinning.” Spun content is written by software AI and makes readability robotic and spam-like. Some local contractors use the software anyway to mass produce pages for every city, town, and even county within their general area. Google has smartened up to this pitiful concept and started to penalize websites that engage in it. You should still write city pages, but they should be unique and specific to the location that they are optimizing for, rather than a re-hashed duplication of another page. The optimization components most widely understood by the general public are methods known in totality as on-page SEO. They include the alteration of title tags, meta descriptions, header tags, URL slugs, as well as content writing. The SEO strategy created earlier in the process will be used most frequently with on-page SEO. You will take the keywords chosen in your research phase and implement them onto your web pages in a variety of formats. Most roofers who have some knowledge of digital marketing associate SEO with on-page methods, and rightfully so. They are the most straightforward tasks and the ones that are most frequently discussed in the mainstream. Roofing SEO takes time and patience but it also has a lasting influence. When you optimize a page for search, you are not just looking for short term gratification but also for long term equity. Pages that you create and optimize today could end up serving your business well for decades to come. As they grow older and gain tenure, they will also gain authority. The better your pages are optimized, the higher they will rank, and the more they will venture into other forms of SEO including off-site SEO, local SEO, and technical SEO. Knowing this, it is important to be precise when performing on-page tasks. The keywords included in your strategy will be deployed in a variety of ways during on-page optimization. From title tags to meta descriptions, and the body content in between, you should make proper use of keywords by placing them in the most opportunistic spots. The left-hand side of any of the elements mentioned is normally that spot. But be careful, you want to avoid redundancy and you want content to enhance the reading experience, not hinder it. 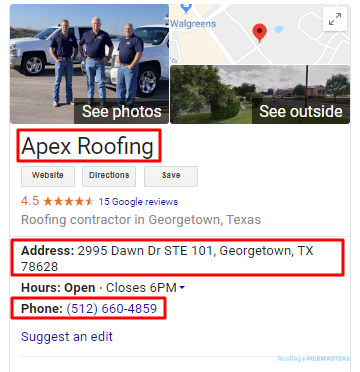 So if your keyword is roof repair in “city”, your title could be Roof Repair in City, your H1 could be Roof Repair Services, and your meta description could read; “Roof Repair Services From [Company Name] Are Affordable, Reliable, and Easy to Schedule. Residents of [City, State] Can Call [###-###-####] To Schedule Their Services Today!” You now have the keyword in three on-page elements without any of them sounding spam-like or misleading. You should follow suit for H2 and H3 tags, as well as image alt text and the paragraph content on the page. One thing to remember at all times is; never stuff keywords. Only use the term within your paragraphs when it makes sense to the reader. Prior to 2012, websites could often manipulate search engines through keyword stuffing. They would use a keyword term over and over again at the expense of content readability. Since Google was less adept at grading user experience back then, the poor content quality did not lower the page’s ranking. Fast forward to 2019, and the opposite is now true. Keyword stuffing not only doesn’t help you rank anymore, but it can hurt you to the point of penalization. So what should you include instead of redundant keywords? The answer is semantic search. You can use LSIgraph.com to find topically relevant terms that are associated with your primary keyword. You should use your main term a couple of times, and then use the other LSI keywords to supplement it. Again, always prioritize the reading experience first and foremost. Anything that looks like spam will hurt your chances of ranking. LSI as a concept is about topical relevance. When Google sees related terms all existing in a single page of content, they will attribute a macro-level relevance to the page itself. The Title Tag or SEO Title of a page is the one that appears on Google SERPs as the clickable portion of the result. You want keyword relevance of course, but you also want something that urges people to click. When a user clicks on a page it increases its click-through rate (CTR) and sends a signal to Google that people like what they see from your initial result. This can be a double edge sword if you’re not careful. You want an appealing title tag, but also one that is representative of your actual website and services. You don’t want to mislead anybody, because they will just exit immediately if they feel like they’ve been swindled. 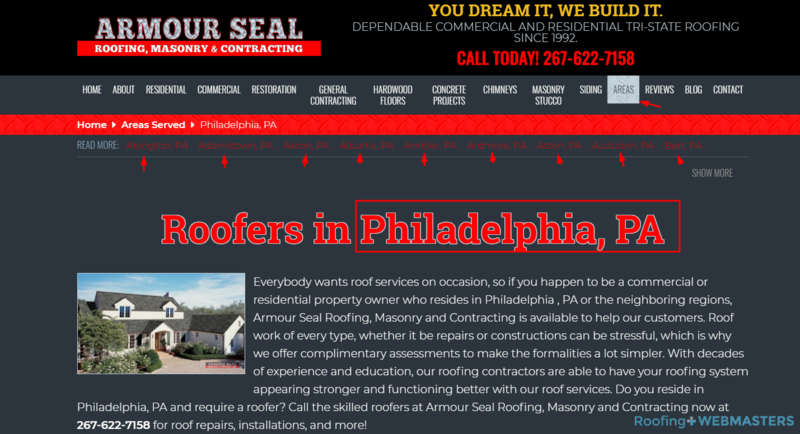 For local roofers, you won’t need anything too over the top within a title tag. It might be something as simple as “Roofer in Atlanta GA | Schedule Your Roof Inspection Today.” Google Analytics will help you monitor the click-through rate, and you can adjust your title tag based on behavioral metrics. Moz can help you preview a title tag to ensure it’s within the character limit for optimal presentation. The text underneath the title tag on a SERP result is known as the meta description. Depending on who you ask, the character limit is either 150-160 or 300. Google had temporarily changed the way they showcase certain meta descriptions but have since resorted back to their original methodology. A meta description should appeal to the search engine user in the same way the title does. It’s not quite as important because fewer people actually read it. Still, it helps to have one instance of the keyword, and an accurate depiction of what the user will find when they click through. You can even include your phone number towards the beginning of the meta description so that consumers have the option to call you before ever entering the site. Headings are important for formatting purposes, but research shows that they also matter for search rankings on a more direct level. There are several types of header tags. You have your H1, your H2, and your H3. Some websites even have H4s and H5s depending on their style sheet. The header that matters most for on-page SEO is the H1. It is essentially considered a subtitle on a given web page. That’s why it’s ideal to have your keyword within the H1. But as we stated before, your H1 should never look spammy. The keyword must fit naturally within it and make sense within the context of the page. H2s and H3s are more important for formatting than anything else. But as you should know, formatting enhances the user experience, which positively impacts search rankings. They also serve as a great way to categorize sections of a page. The URL slug or the permalink is the section of a web address that appears on theright-handd side. 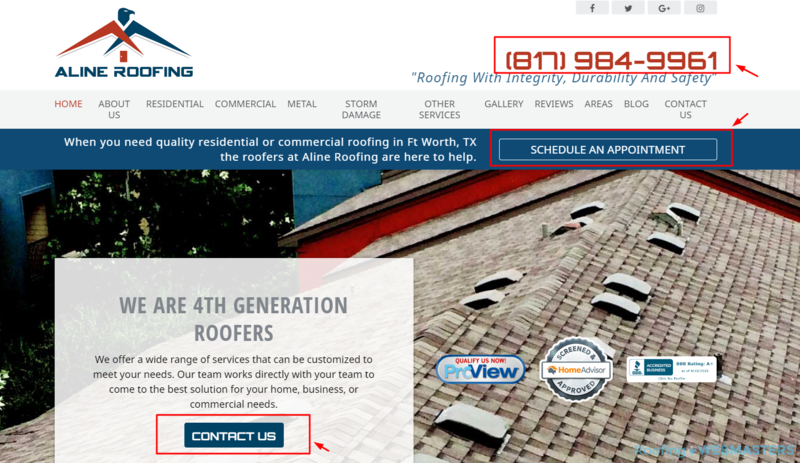 So if your website is MyRoofingCompany.com and your page is created as a lower level page underneath a parent page like Residential Roofing, your URL Slug would be MyRoofingCompany.com/residential/enter-url-slug. What you fill in as the URL slug should be topically relevant, concise, and if possible, include the keyword. An example of a good URL slug for residential roof repair is MyRoofingCompany.com/residential/roof-repair. You’ll notice how that reads better than an alternative like MyRoofingCompany.com/residential/residential-roof-repair. There’s less redundancy in the former example, and the latter one is harder for Google crawl and also uglier to look at for your visitors. URL slugs are known also as permalinks because they are in fact permanent. If you end up not needing the page anymore you can implement what is known as a 301 redirect, which will auto-direct a user from that page to a newer one. Still, the permalink will remain intact. A sometimes overlooked on-page optimization factor is image alt text. It is the description of an image on your web page. For those of you who don’t know, an image file should always be titled in lower case letters with dashes. If you upload an image of your roofing truck, a good file name would be company-name-truck.jpg … or something to that effect. Once the image is uploaded and embedded into your content, you should fill out its Alt Text. This is more or less a description of what the image is. So if it’s your truck, the Alt Text should be very similar to the title, something like; Company Name Truck. This is a small but effective task for on-page SEO. If you’ve wondered why on-page SEO isn’t just called “SEO” it’s because there are other kinds of optimization that take place away from a website and its pages. These tasks are referred to as off-site SEO or sometimes off-page SEO. Regardless of which term you subscribe to, the concept is the same. Google evaluates signals from external sources to judge your web presence in totality. One of the strongest examples of this is inbound linking. In fact, inbound links were the original measure of a website’s value and remain one of the most important ranking factors to this day. Although link building was once easy to manipulate, that is no longer the case. Successful off-site SEO requires more work than it once did. For links to hold value, they must be relevant to the entity to which they link. A diet pills website that links to your roofing repair page will not do much to boost its value in the eyes of Google. Links come in many forms, including from social media platforms, business listing directories and other websites throughout the net. The goal for off-site SEO is to expand brand awareness and develop a web presence over time. A company website is not the only representation of your roofing business online. With Facebook, Instagram, Twitter, LinkedIn, and YouTube, roofers can leverage free social platforms to expand brand awareness. Since these web entities exist exclusive from your main site, they are considered “off-site” and therefore; part of an off-site SEO strategy. Many times with social media, on and off-page methods can be merged. For instance, sharing an internal blog post on your LinkedIn feed contributes to both on and off-page elements. Moz also considers social signals to be a local ranking factor and so social media activity in of itself is likely to enhance your overall development. There’s so many ways to build inbound links to your website, some of them help and some of them hurt. Antiquated tactics such as buying links from blog comments or PBN’s are frowned upon by Google. While they won’t necessarily cause penalization in 2019, their zero-sum value contributes to a depletion of resources. Better ways to build links involve networking with other web entities or personalities, including marketing influencers. Blogger outreach is a way to pitch your website’s relevance for inclusion in a guest post on another domain. The more relevant the domain is to your roofing company, the more link juice will navigate towards it. Earning links naturally remains the safest and most effective strategy, and writing great content that ranks is the best way to achieve that goal. Since major web entities like Facebook and Yelp hold so much authority online and since any individual can embed a link on their page, Google qualifies these links as NoFollow. What that means is that while they can still contribute to brand signals, which is a more subtle form of authority building, they won’t actually boost your domain authority score as measured by Moz, or any similar metric from SEMRush, AHRefs, and Majestic. Despite this exclusion of direct influence, the value of NoFollow links should not be dismissed. Google still crawls these links and acknowledges that they do in fact lead back to your website. Best of all, these links are coming from trusted sources. Inbound links from regular websites (i.e. not social media or blog comments) hold direct influence over domain authority. 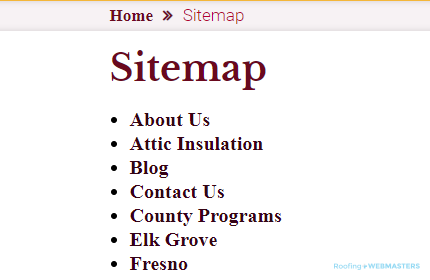 Let’s say a blogger for a major local publication links to your roofing company website. The authority of their own site is transferable to yours. Let’s say they have a DA of 85 and you have a DA of 10. You can expect to move up a couple of DA points from a link of that quality. With enough volume of high quality links, you will begin to move up exponentially and increase your website’s authority. This is a factor in Google trust and something that can help you improve your position on SERPs in 2019. Websites earn rankings not just from on-page optimization or off-site link building, but also from technical optimization. Technical SEO is executed behind the scenes on the back-end of a website. It involves the refinement of HTML & CSS coding as well as the implementation of microdata tags known as schema markup. Schema helps Google parcel data and most appropriately rank your website based on its subject matter and relevancy. Technical optimization also involves issues like 301 redirection, XML sitemaps, and site speed optimization. For roofers without knowledge of computer programming, technical SEO can be the most foreign of all optimization tactics. To the average eye, HTML and CSS looks like nothing more than gibberish. But Google views the code far differently than an internet user would. To Google, the technical aspects of a website are important when determining their inherent value. Most of all, they contribute to the process of driving relevant users to websites that will address their needs. When a webpage is no longer valuable to visitors it should be redirected to a more relevant page. The reason why you don’t want to just outright delete a page is because it has already been indexed by Google. If you delete a page it can cause major problems for your website and hurt your overall SEO efforts. With a 301 redirect, the URL destination will remain indexed but funnel the users who click through to a superior page without them even realizing what happened. Every website needs an XML sitemap to encourage Google to index every page. Since not all pages will be internal links from the homepage, you still want them to be indexed on search engines. Sitemaps are particularly useful for websites that are larger in scale, as Google has a more difficult time crawling the amount of pages present on sites like these. Like with other forms of technical optimization, the goal is to make Google’s crawling process as simple as possible. Marketing agencies come and go through the years and very few of them specialize in one specific niche. As you can tell by our very name, Roofing Webmasters is dedicated to the roofing industry. 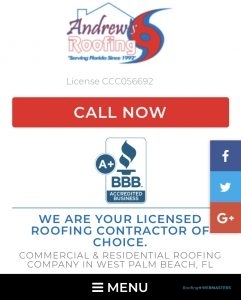 As a company specializing in SEO for nearly a decade, we are the clear choice for roofers looking to expand their web presence in 2019. With a combination of experience and skill, our team of webmasters is equipped to handle any marketing venture a roofer chooses to pursue. Because of the magnitude of your investment, choosing the “right” SEO company can shape the future of your business. Roofing Webmasters follows Google’s guidelines to ensure that all tactics are white hat. We don’t participate in black hat tactics such as keyword stuffing, doorway pages, or sneaky redirects. Because Google is the top search engine in the world, and almost certainly will be for the rest of our lifetime, we view their recommendations as the gold standard of SEO best practices. Our team consistently monitors the industry for new trends and executes them ASAP. As the most noteworthy Roofing SEO company in the United States, we have hundreds of clients on board. We have helped develop online visibility for all kinds of roofing businesses, from those just starting up with a brand new domain name, to those who’ve been around for multiple generations. In each scenario, we implement our core principles while also integrating the client’s personal vision. As Google continues to evolve to best satisfy the needs of its users, we parallel their forward progress to maximize the search visibility for our own clients, not just in 2019, but far beyond.